Super Soldier Steve Rogers will be leading the charge to 4K UHD in February. 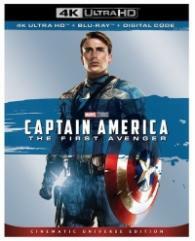 According to Best Buy, Disney is preparing Captain America: The First Avenger for 4K Ultra HD Blu-ray on February 26. A SteelBook will also be available for purchase on the same date. Meek U.S. Army soldier Steve Rogers (Chris Evans) takes part in an experimental military program that infuses him with super-human powers, and uses his newfound strength to battle the villainous Red Skull (Hugo Weaving) in this comic-book adventure from director Joe Johnston (The Wolfman, The Rocketeer). Tommy Lee Jones, Neal McDonough, and Stanley Tucci co-star in a film written by Christopher Markus and Stephen McFeeley (who previously collaborated on The Chronicles of Narnia: The Lion, the Witch, and the Wardrobe). ~ Jason Buchanan, Rovi. You can find the latest specs for Captain America: The First Avenger - 4K Ultra HD Blu-ray linked from our 4K Blu-ray Release Schedule, where it is indexed under February 26.